Just did my first oil change on the R11s. Pretty straightforward, but the filter wrench I got from the auto parts store slipped a little while tightening. Tried a bit of duct tape on interior of wrench to make it fit tighter. Think I am weeping just a bit of oil still. Do I need to have the BMW wrench? Or should I just check around at auto parts stores for one that fits tighter? When I bought this one, seemed ok. I get mine at NAPA. But you can get 'em anywhere. So yeah, check around at the parts store, any auto parts store, take a filter in with you. Did the rubber seal ring come out with the old filter? Sometimes they stick to the engine. If you got the old gasket off, and wiped the engine case, and put a film of oil on new filter, there shouldn't be anything leaking. It really doesn't have to be that tight, I have over tightened an oil filter and damaged the gasket (I know I'm the only one who ever did that). I have a wrench from Advance, and a cast aluminum wrench that fits much better. You might put a wrench on it and give it another little snug to tighten it. I have used Bosch filters, both he motorcycle specific one and the car version. Neither leaked on me. 2001 RS1100S Light. Black on Black w/carbon fiber bits. The filter wrench is 14 flats, 74 mm diameter ... nearly the German standard. Usable on many, many German vehicles. The most common reason an oil filter leaks on any engine is that the new gasket wasn't lubricated with oil.. They like to keep you on your toes. pretty sure I wiped with interior of the filter cavity. If I did not get it super clean, maybe some old oil is heating up and running down. Again, very small amount, I am pretty sure. I did get the old gasket and I lubed the new gasket on new filter with old oil. I went around to a couple auto parts stores yesterday and no other filter wrench they had fit any better than what I have already have. I will continue to monitor. Maybe I am ok. 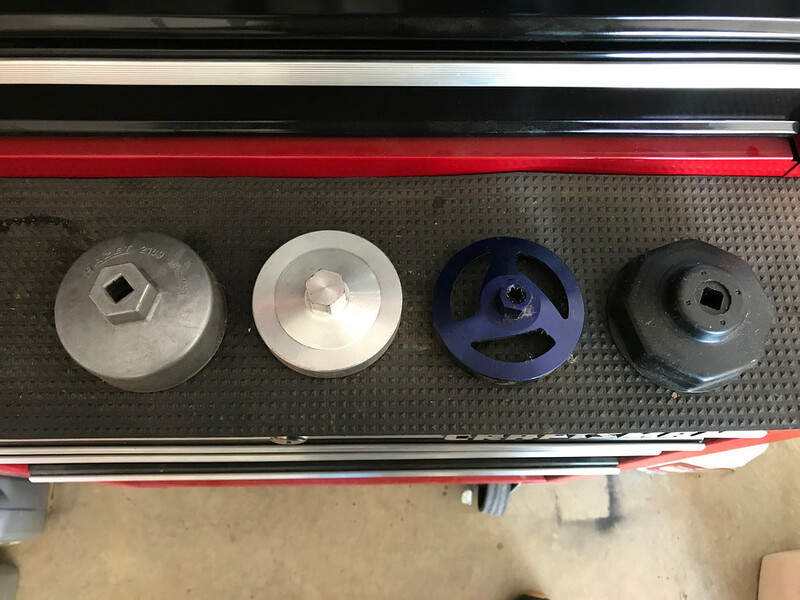 I've had issues over the years getting a wrench to work, then I found that the K&N oil filers have a nut on the top, so you do not need to worry. Finding the right size wrench for that is a bit easier and you can torque it to spec. Sometimes the K&N oil filters nut come off . The K&N oil filter is round with no flutes, and if the nut comes off , and because the BMW oil filter reside in a recess, there will be a lot of choice words. I save a few good words for the first time that happens. I'm using them in both my boxers and my Boxster and have found that lock grip pliers save me a lot frustration. Flogged the R11S a bit today. Seems I am ok. Maybe the oil drip on the new filter was old oil from the cavity. I did realize, however, that in checking oil level, I thought I was low. Just could not discern the level with the fresh oil. It appears as though its easier to see the dirty oil vs. the new! You definitly should be able to see the oil in there. It might be very light colored, but will be like light honey. If you learn to get down on the side of the bike and push it up with the handlebar, balancing it at the top (without dropping it of course), you should see the oil level moving in the sight glass as you rock it back and forth slightly.